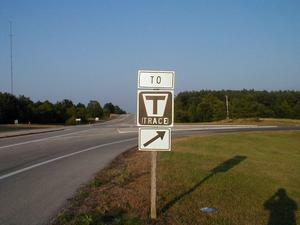 This page contains news and information about roads and highways in Marshall County, Kentucky. Kentucky Atlas and Gazetteer: Marshall County - Basic geographic and demographic information about the county. Kentucky Transportation Cabinet: Scheduled Public Meetings: District 1 - Schedule of any upcoming public meetings in Marshall County. AURORA, Ky.– Repairs to the U.S. 68/KY 80 Eggners Ferry Bridge are on track for reopening of the damaged bridge in time for the Memorial Day weekend. Crews from Hall Contracting of Kentucky Inc. lifted a new truss span into place on Tuesday, May 15. Today, they are placing the last of the reinforcing steel and forms required for pouring a concrete deck on the new span this weekend. They plan complete final preparations on Saturday morning to be prepared to pour concrete starting on Sunday morning. The concrete pour is expected to take about 5 to 6 hours to complete. FRANKFORT, Ky. (May 24, 2012) – Gov. Steve Beshear hailed tomorrow’s planned reopening of the U.S. 68/KY 80 Eggners Ferry Bridge – a full 2 ½ days ahead of schedule. Hall Contracting of Kentucky Inc. completed the emergency repairs on the bridge earlier than required, and the bridge is expected to reopen to traffic at 1 p.m. CDT Friday. 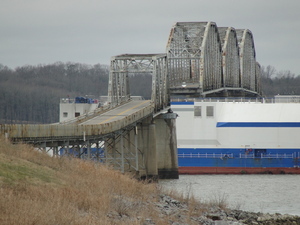 The Eggners Ferry Bridge, which carries U.S. 68/KY 80 across Kentucky Lake, has been closed since it was struck by a cargo ship, the Delta Mariner, on the night of Jan. 26. A 322-foot-long span of the 80-year-old bridge was torn away. 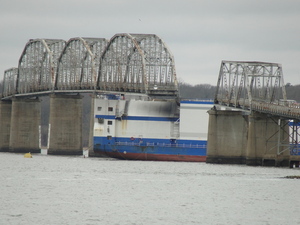 On February 4, 2012, officials allowed public access to the eastern approach to the Eggner's Ferry Bridge to view the collapsed span. 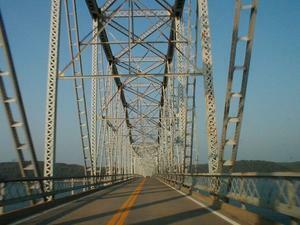 The bridge carried US 68 and KY 80 over Kentucky Lake (the Tennessee River) between Marshall and Trigg counties. 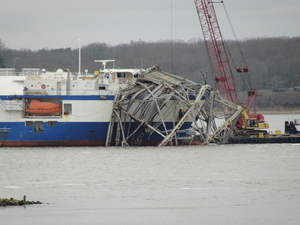 A mainspan of the bridge collapsed after being struck by the cargo vessel MV Delta Mariner on January 26, 2012. The Associated Press is reporting that the Eggner Ferry Bridge which carries US 68 and KY 80 over Kentucky Lake has partially collapsed after being struck by river traffic. It appears that one of the four main truss sections of the bridge has completely collapsed. There were no injuries reported. The final section of the newly construction four-lane route for KY 80 between Aurora and Mayfield will open soon. The new KY 80 runs further south than its original routing and crosses US 641 closer to Murray than the original route. KY 80's original route has been signed as KY 402 for several years. The opening of the new route will once again make KY 80 a continuous route. A dispute over ownership of a road in Marshall County has been ongoing for three years. An adjacent property owner claims the road is on his property; however, the county says the road has been owned by the county since the 1970’s. With work to construct a new four lane section of KY 80 between Aurora and US 641 north of Murray nearly completed, focus has shifted to the next stage of the project: construction of another new four lane section between US 641 and Mayfield. The Graves/Calloway County is currently in the grade-and-drain phase of construction. Surfacing of the highway will not begin for sometime, and the road will not be open to traffic for several years. Funding to continue the reconstruction of KY 80 is included in the new Six-Year Highway Plan. The project to widen KY 80 between Cadiz and Mayfield is broken up into three phases. Phase 1 - Aurora to Murray - Construction on this phase of the project is nearly complete. It begins at the approach to US 68-KY 80 bridge over Kentucky Lake and continues westward to US 641 a few miles north of Murray. Construction started several years ago and should be complete this summer. Phase 2 - Murray to Mayfield - Construction on this phase was recently begun. This $60 million will construct a new four lane highway between US 641 north of Murray to Mayfield. Construction is expected to last for a couple of years. Phase 3 - Cadiz to Aurora - The Six-Year Plan includes $132 million to construct new four lane bridges over Kentucky Lake and Lake Berkeley. Construction on the bridges is scheduled to begin in 2006. Work on the widening project through the Land Between the Lakes has been delayed: the Tennessee Valley Authority gave initial approval for the project; however, ownership of the Land Between the Lakes has since been transferred to the United State Department of Agriculture forest service. Plans for the widening project are expected to be complete this summer, and construction is scheduled for completion in 2007. The existing two-lane stretch of KY 80 between Aurora and Kentucky 58 east of Mayfield has already been renumbered as KY 402. A new four lane route for KY 80 has recently opened between US 68 at Aurora and US 641 at Murray has recently been completed. The Murray to Mayfield section is expected to be open by Spring 2004. The Kentucky Transportation Cabinet will be holding a public meeting to discuss the proposed Interstate 66 in western Kentucky from 5pm to 7pm at Ballard Memorial High School, 3561 Paducah Rd., La Center, KY.
H.B. Elkins posts in this Usenet message that he has learned from Jeff Moore at the Kentucky Transportation Cabinet that KY 80 will be routed along the new road currently under construction between Aurora and Mayfield. The current route of KY 80 between Aurora and KY 58 near Brewers has been renumbered as KY 402. The Benton Tribune-Courier reports in this August 29, 2001 article that pre-construction work has begun on widening KY 348 from the Jackson Purchase Parkway to US 641 in Benton. Construction is schedules for 2004, but may be moved to 2003.